Throughout the later obliteration by Typhoon Yolanda (Haiyan) to our dear brothers in Visayas with over 2,800 families were affected received more than just temporary relief packages from Dole Philippines, Inc. (Dolefil) during its Caravan of Hope Relief Operations in the municipalities of Culasi and Tibiao in Antique and Sigma in Capiz on December 2, 2013. Sigmahanons patiently wait for their turn to receive relief packs from the Dolefil Caravan of Hope. Four units of 40-ft winged vans left Polomolok, South Cotabato on November 29 for Panay Island, together with 54 volunteers from Dolefil and its partners for the relief effort. "It's the first time na yung binagay na goods dito sa amin is a complete package, with shelter, food and blankets. So far, ito ang pinakamalaking naibigay per family dito and we feel that we're blessed na kami ang napili ng Dole, (This is the first time that we were given a complete package, with shelter, food and blankets. So far, this is the biggest help that the families here have received and we feel that we’re blessed to be chosen by Dole)" remarked Hon. Chris Andaya, Mayor of the Municipality of Sigma. The Dolefil Caravan of Hope relief packs addresses the primary needs of the beneficiaries through the distribution of clothes, underwear, tarpaulin sheets (trapal), ropes, cooking pots, sleeping materials, mosquito nets, survival and hygiene kits on top of the food package which includes rice, canned goods, salt, sugar, coffee, milk and several cans of Dole products. Along with this, a team of physicians from South Cotabato conducted a medical mission to address the health needs of the survivors. Volunteer doctors from South Cotabato were able to serve more than 800 patients in just four (4) hours. 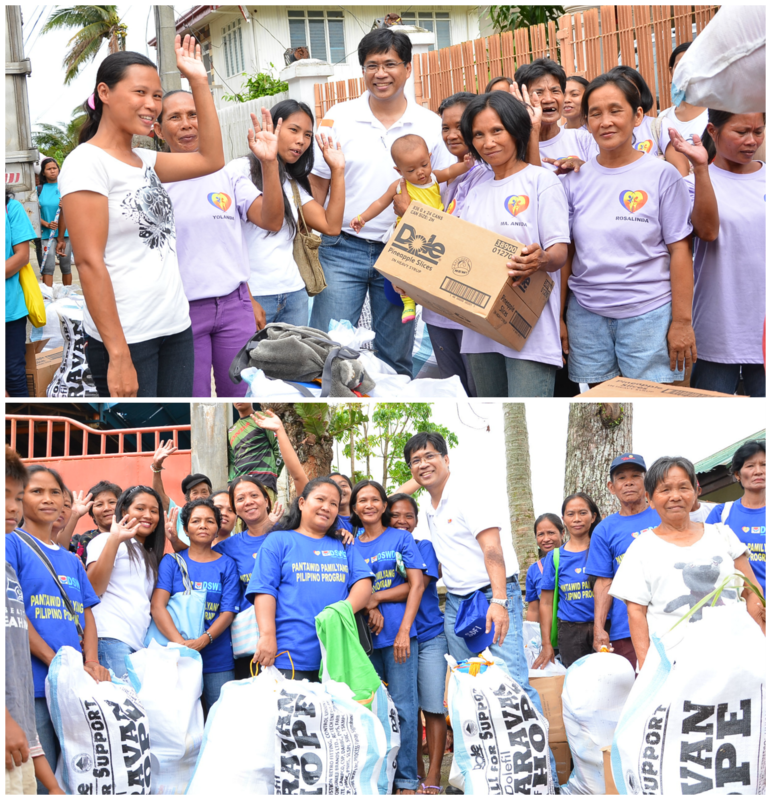 ...to the Caravan of Hope team upon receiving their early Christmas gifts. "Madamo gid nga salamat sa tanan nga nagbulig sa amon sa sini na kalamidad. Dako ni nga bulig sa amon kay subong daghan sa among gamit nangaguba, (Thank you so much to all those who helped us during this calamity. This is a big help to us since our properties have been damaged)" a Yolanda survivor, a mother with five kids, added. with the goods from Dolefil and its partners. "We chose to provide relief to Antique and Capiz because other provinces have been receiving help from other institutions whereas these areas still need a lot of aid," Atty. Melquiades L. Hernandez III, Corporate Affairs Division Director of Dolefil explained. Atty. Mel Hernandez shares a smile with the Yolanda survivors who were very thankful of the help they received. Based on the report from the National Disaster Risk Reduction & Management Council (NDRRMC) on Typhoon Yolanda, the cost of damage Region VI (including Antique and Capiz) is estimated at P3 billion, with over 572,328 families affected. 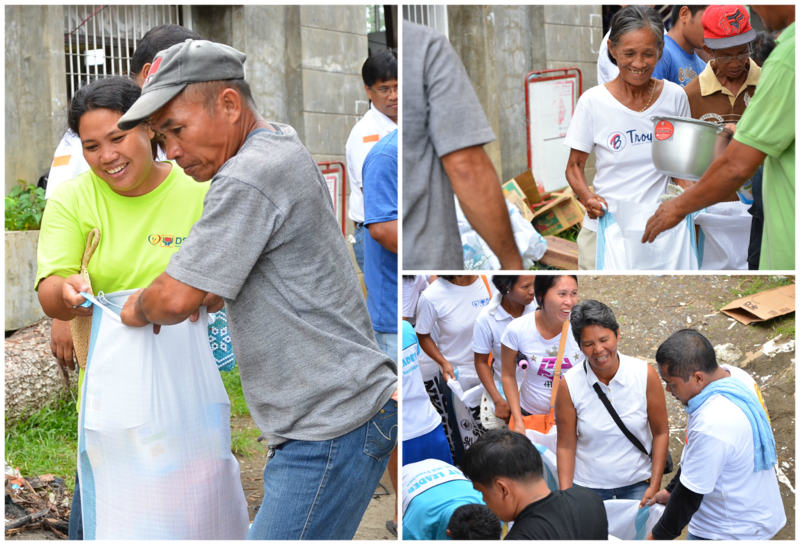 On December 2, 2013, more than 50 volunteers traveled to Panay Islands to distribute 1,800 relief packs to individuals and families affected by the typhoon. Check out the video to know more about this story. “Dolefil is very thankful for all those who have contributed to the Caravan of Hope, to all the employees who donated, to our friends and business partners. We wouldn’t be able to go a long way without everyone’s support,” Dolefil VP and Managing Director Simon Denye stated. via tricycles loaded with their relief packages. The Dolefil Caravan of Hope is a "bayanihan" project initiated by Dolefil with its partner, Mahintana Foundation, Inc., along with its three unions, LEAD, LEAD.PH and LEAD-Calumpang, and APASI/Nordson, GAME Equipment, Combustion Retrofitting, Pave Consumer Ltd., MG Marketing Imports, Control Union Philippines, DARBC, UEMSMPC, SRC, FARB, TIBUD, CAMPCO, PMSC, MMHCFI, DECCO, LR Specialists Builders, 2GO, NFI, Twin Circa, SLSPI, PNHS, BSNHS, CSP, LPMPC, AMCOOP, MMCS, Digital Detours and CV Travel & Tours, and in coordination with i-CODE, PhilDHRRA, PROCESS-Panay and SDFI.